Dan Blanton, from San Jose, California, now living in Morgan Hill, California with his wife, Cindy, is a well-known and respected fly fishing and casting instructor, lecturer, fly fishing author and outdoor photographer. He is acknowledged to be one of the pioneers in the development of Pacific coast and Central American saltwater fly fishing. He is the recipient of the Federation of Fly Fisher's 1990 Arnold Gingrich Memorial Life Membership award for outstanding achievement in outdoors writing as related to fly fishing. 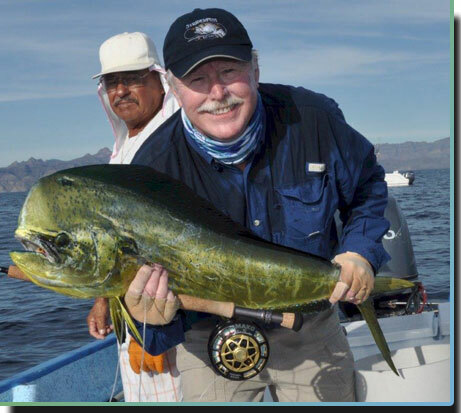 He also is the Federations of Fly Fisher's 1995 recipient of the Silver King award for outstanding contributions to the sport of saltwater fly fishing. In April of 2002 Dan was inducted into the N.C.C.F.F.F. California/Nevada Fly Fishing Hall of Fame. In October 2009 Dan was inducted into the The Catskill Fly Fishing Center and Museum Fly Fishing Hall of Fame. An acclaimed fly tier, Dan originated the Whistler Series, Punch Series, Sar-Mul-Mac Series, Sea Arrow Squid, Bay-Delta Eelet and many other world renowned saltwater fly patterns. His patterns, originated in the late 1960s and early 70s, remain popular and productive world-wide. The former Managing Editor of Angler Magazine, Dan is currently an Editor-at-Large for Fly Fishing Salt Waters magazine, Fly Fisherman magazine and the California Fly Fisher. Dan is also one of The Complete Fly Fisherman of South Africa's International Field Editors. He was the Salt Water Fly Fishing columnist for Sport Fishing magazine and Fly Fish America magazines for more than a decade. A free-lance writer for more than 40 years and an active member of both the Outdoor Writers Association of California, and the Outdoor Writers Association of America, Dan contributes regularly to many fly fishing periodicals both in the USA, Australia, Japan and South Africa. His Book Fly Fishing California’s Great waters have received excellent reviews. More than 25 years ago, Dan published his website www.danblanton.com as a means to promote his outdoors professional business. He also wanted to give something back to the fly fishing community so he included a fly fishing bulletin board; tackle and techniques fly-fishing magazine page; a What’s Hot and New page; a hot fly page and others of interest to fly-anglers. Dan’s Fly Fishing website and bulletin board/forum are extremely popular, world-wide with a large International community. Dan Blanton's Bulletin Board Community founded Striperfest, the largest fund-raiser dedicated to the preservation of the California Delta and its striped bass. This extremely important event just celebrated its 20th year. Visit www.danblanton.com/bulletin.php.